Aaron, Riley and I were discussing an improved drive system over Skype when I quickly created this graphic. Our 4 wheel drive system worked exceptionally well at RoboCup in Germany, and we were thus hesitant to make any drastic changes. We’ve been discussing the issue on and off for a number of months, and we’ve reached a conclusion that we’re all happy with. The idea behind our new wheel-belt tandem system is that the wheels do all of the work and the belt helps the robot over terrain where the wheels get caught in the air. On relatively flat terrain, the belt should not interfere with normal operation. 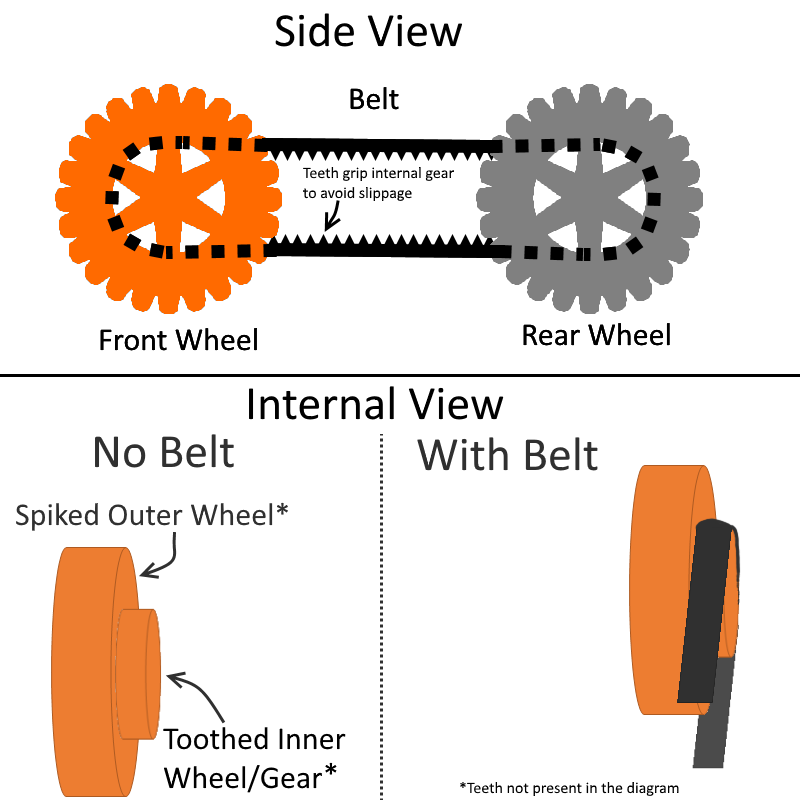 The belt should have teeth on both sides to provide the required grip. Radius of the inner wheel – How far away from the edge of the outer wheel should the belt be? Width of the belt – We don’t have much room to spare in our current design, and we don’t want to cut back on wheel thickness. Spacing of the teeth on the outside of the belt – What is the optimal spacing for optimal grip? And finally, we’ll have to test if the belt even works as we intend it to. Overall, though, we’re excited to try out this new design.